Never heard of it, nor can it be found through Firefox Add-ons Manager. Try switching to SearchWP. Explain how it is nonsense? Well, let's start with the article calling the white settlers, illegal aliens. I think what Lucario and Mach are trying to do is justify Mexican illegal immigration into our country today based on some native indian ancestry. What they fail to recognize is that the tribal ancestors of the Mexicans were not indigenous to this country as they settled way south of our border and no one can claim a right to an entire continent as all the tribes were different and settled in different areas of this continent and protective of these lands against one another. Another thing they fail to recognize is that most Mexicans are also of that so-called evil white Euoropean ancestry aka the Spanish. That makes them part invader themselves according to Lucario and Mach. How about it Lucario and Mach. Want to address the above? Are you trying to justify Mexican illegal immigration into this country based on the native indian history in THIS country? And why is it that we aren't hearing any complaiming from the descedants of the Comanches, Navajo, Apache, etc. who were indigenous to THIS part of the continent but only Mexicans complaining when their tribes were not? I didn't mention Mexican illegal immigration once. All I said was - or agreed with - was that the first European settlers on this land were also illegal immigrants. You could also easily make a case that the British government officials who fought against American independence resemble the Mexican government today. Like the Brits the Mexican government also argues against American sovreignty and encourages people to invade this country. Just as Brits demanded we prop them up, so too does the Mexican government demand that we allow them to send their citizens here and use the remittances to prop up their government. Just as the founding fathers had the right to gain freedom from the Brits so do Americans today have the right to conduct our affairs and establish our requirements for citizenship without interference from Mexico. I'm deeply sorry many Mexican officials and Mexican citizens seem to think otherwise. Did I say that you did? I am the one who mentioned it and I asked if you and Mach are using native indian history to justify Mexican illegal immigration into our country today. Just answer the question. 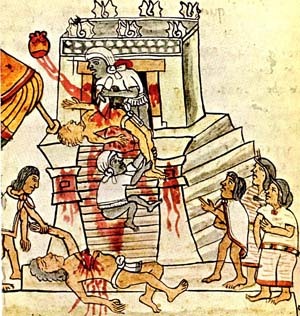 Each other AND the Aztecs sacrificed those captured. You seem to selectively remember and selectively forget history because it doesn't suit your point of view. polaroids weren't available back then so they drew pictures. Did I say that you did? I am the one who mentioned it and I asked if you and Mach are using native indian history to justify Mexican illegal immigration into our country today. Just answer the question. No, I don't support or oppose Mexican illegal immigration. I am just pointing out the ironies. People who are so against it are descended from illegals themselves. Most of us are NOT descended from illegals. There's nothing ironic about someone who's grandparents came through Ellis Island asking others to do the same. The premise of this whole thread is silly. America was NOT founded by illegals. America was founded during the Revolutionary war by natives. Americans today have the right to control our borders. Mexican nationals, who constitute by far the loudest voices in favor of illegals and the largest numbers of illegals, are themselves descended from Spanish conquorers who were far more brutal to the natives than most Jamestown colonists. The irony is their nerve in pretending otherwise. Seeing as the native Americans signed treaties giving land to settlers, that wasn't exactly "illegal", and since there was no unified system of government, even within the same tribal groups, its hard to say what kind of immigration policy they had. Most of the Mexican nationals who come here are more native than Spanish conqueror. The descendants of the conquistadores have no reason to leave Mexico, as they have most of the wealth and land.